Kids tickets are free for the Rays vs. Astros games August 17-20. 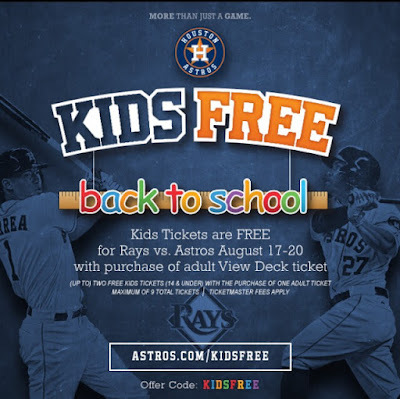 Bring your family out to Minute Maid Park before the kids go back to school and get up to two free kids tickets (14 and under) with the purchase of one adult ticket* for View Deck I + II and Outfield Deck I + II seats. Use code "KIDSFREE" when purchasing tickets.